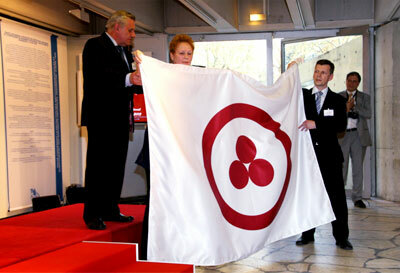 April 2, 2012 saw the grand opening of the exhibition “The Roerich Pact. 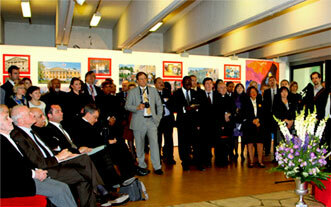 The Past and the Present” at the UNESCO headquarters in Paris. 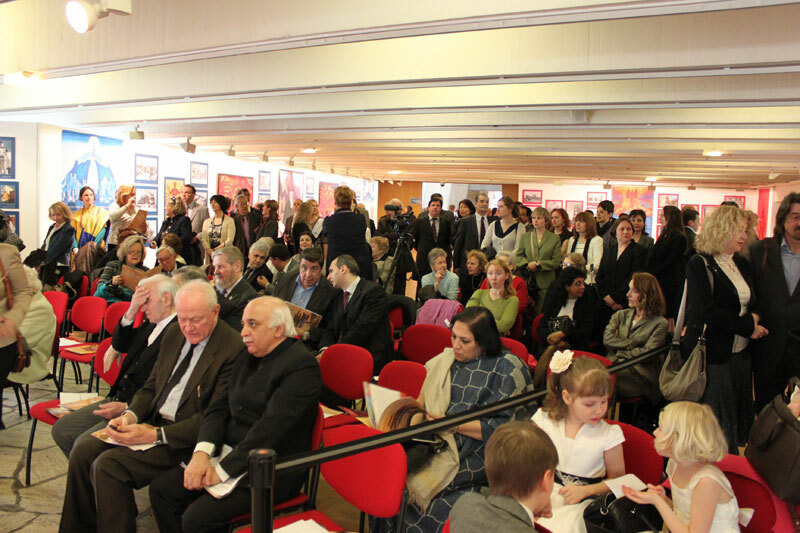 The exhibition was organized by the Permanent Delegations of Russia and India to UNESCO in cooperation with the International Centre of the Roerichs with support of the Ministry of culture of the Russian Federation and UNESCO. 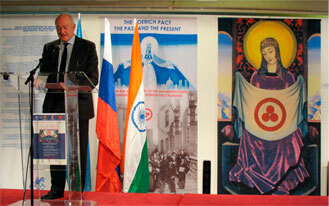 The exhibition was timed to the 80th anniversary of the 2nd International Conference for the Roerich Pact and the Banner of Peace that was held in Bruges (Belgium) and played a crucial role in promoting the Roerich Pact as an international legal act (treaty) for the protection of the world cultural heritage. The exhibition, dedicated to the artistic and ideological oeuvre of Nicholas Roerich, the illustrious Russian artist, scientist, thinker, humanist, writer, traveler, and public activist, marked a significant cultural event and received a great number of visitors and journalists. The exposition included more than 100 unique archive documents from the International Centre of the Roerichs collection, historical photos pertaining to the Roerich Pact, and reproductions of paintings by N. Roerich reflecting ideas of cultural heritage preservation. The exhibition also included modern photographs depicting the irreparable loss of cultural heritage inflicted upon many nations in the recent decades, as well during the Second World War and other armed conflicts. Mr F. Bandarin, UNESCO Assistant Director-General for Culture; Mr A.A. Avdeev, Minister of Culture of the Russian Federation; Mrs E.V. Mitrofanova, Permanent Delegate of the Russian Federation to UNESCO; Mr V.S. Oberoi, Permanent Delegate of India to UNESCO, and Prof. A.V. Postnikov, President of the International Centre of the Roerichs, addressed the participants of the grand ceremony with greeting speeches. Speaking on behalf of Mrs Irina Bokova, UNESCO Director-General, Mr F. Bandarin read her greeting speech in which she said: “The exhibition pays tribute to the great Russian activist, a versatile and extraordinary gifted person. N. Roerich contributed to the history not only due to his Art, but also due to his fervent belief in the need to protect the world cultural heritage. The exhibition is a tribute to the mighty influence of his idea. What is the most important is that N. Roerich could made this idea come true. He was the initiator of a treaty for the Protection of Artistic and Scientific Institutions and Historic Monuments, widely known as the Roerich Pact, which was signed in 1935. It was the efforts of the civil society and public organizations from all over the world for the protection of cultural heritage that led to the creation of the Roerich Pact. For many years the principles laid down in the Pact have been inspiring UNESCO activity for the preservation of all kinds of heritage and the world cultural diversity. Mr A. Avdeev, Minister of culture of the Russian Federation, emphasized the international significance of Nicholas Roerich’s oeuvre. He also noted the invaluable contribution that Ms Ludmila V. Shaposhnikova, First Vice-President of the ICR, Director-General of the Museum named after Nicholas Roerich, made to the study and popularization of the Roerichs’ heritage, as well as to its preservation for the future generations. Mrs Eleonora V.Mitrofanova, Permanent Delegate of the Russian Federation to UNESCO, spoke about the life and versatile achievements of Nicholas Roerich in the fields of art, science and public activity, and about his relentless struggle for the international propagation of the Pact that resulted in the signing of the treaty by 21 nations including the USA. Mr V.S. Oberoi, Permanent Delegate of India to UNESCO, told about the great love and respect of Indian people for the Roerich family. He also spoke about the family’s dedicated service for the welfare of the world. Prof. A.V. 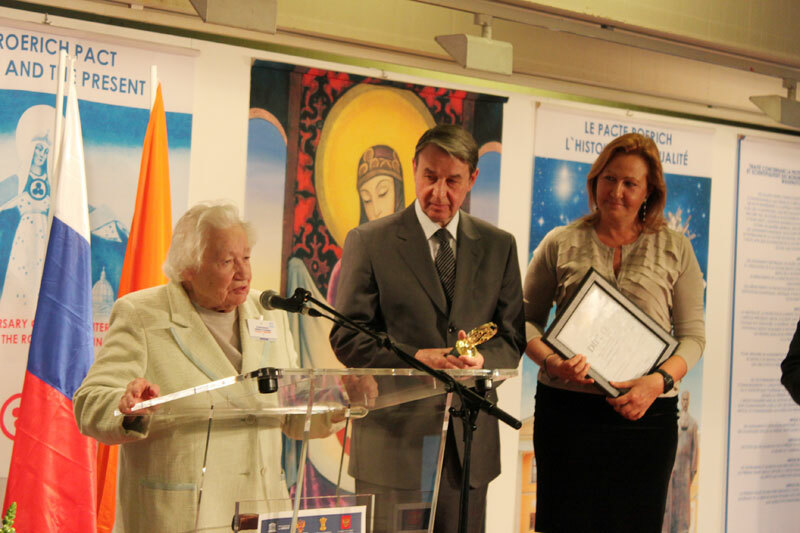 Postnikov, President of the ICR, noted the important role of the Roerich Pact and the Banner of Peace for preserving culture and the foundations for lasting peace in the world in which labour and creativity are of paramount importance. The program of the exhibition opening also included the prize presentation ceremony of the Charitable foundation for the revival of national, cultural and spiritual heritage “The Tree of Life”. Mr E. Falt, UNESCO Assistant Director-General for External Relations and Public Information, announced the winners of the Prize for 2012: B. Boutros-Ghali, President of the UNESCO International section for democracy and development, UNO 6th Secretary General; Ms L.V. Shaposhnikova, philosopher, scientist, public activist, Director-General of the Museum named after Nicholas Roerich (Moscow); Mr K. Singh, Diplomat, Chairman of the Indian Council for Cultural Relations; Mr Ch. Aznavour, Ambassador, Permanent Delegate of Armenia to UNESCO, singer and composer. 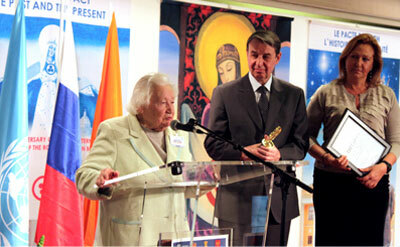 The prizes were presented to the winners by Mr A. Avdeev, Minister of culture of the Russian Federation. Ms L.V. Shaposhnikova in her greeting speech expressed her gratitude to UNESCO, as well as to Mrs Eleonora V. Mitrofanova, Permanent Delegate of the Russian Federation to UNESCO, Mr A. Avdeev, Minister of culture of the Russian Federation, and Mr V.S. Oberoi, Permanent Delegate of India to UNESCO, for their support for the initiative to organize the exhibition dedicated to N. Roerich and the Roerich Pact. She emphasized the continuing importance of N. Roerich ideas of realizing Peace through Culture and delivered the Banner of Peace to Mr E. Falt, Assistant Director-General for External Relations and Public Information at the UNESCO. Mr A. Rosendent, scholar of the Charitable Foundation named after Helena Roerich, played in honour of L.V. Shaposhnikova the Adagio from Sonata G minor by Johann Sebastian Bach.